The finest soccer player the USA has ever produced, we all know Borussia Dortmund's Christian Pulisic would walk into any team in world football today - but how do the other 40 or so Americans to have represented a Bundesliga club rank? Although Keller only spent one-and-a-half seasons in the Bundesliga, the second most-capped goalkeeper in the history of the US Men's National Team left a lasting impression. Gladbach were battling desperately to keep their heads above water when he joined the club from English Premier League outfit Leicester City in January 2005. It was a fight they would win, thanks in no small part to Mr. Magoo's seven clean sheets in 17 Rückrunde appearances. No one better epitomises 'one-man club' than Cherundolo. Moving to Hannover from the US as a 19-year-old in 1999, he went on to make over 400 competitive appearances for the 96ers. He eventually became Hannover captain, before playing the last of his 302 Bundesliga games in a 2-1 defeat at Freiburg on 21 December 2013. After Andy Mate, who passed away on 13 May 2012 at the age of 71, not a single American played in the Bundesliga until Dooley helped Homburg work their way up from the third tier to Germany's top table by the end of 1985/86. Born in the German capital in 1993, four years after the Berlin Wall came down, Brooks is the son of an American serviceman from Chicago. He was linked with record champions Bayern Munich in his younger days, but ultimately plumped for hometown outfit Hertha Berlin. The decision changed the fortunes of player and club. Another dual national, Frankfurt-reared Chandler came up through Eintracht's youth team before leaving to join Nuremberg in 2010. It was in upper Bavaria where he was repurposed as a full-back - the role he now occupies for club and has done for country. With 102 senior club appearances under his belt, Chandler re-signed with Frankfurt following Nuremberg’s relegation to Bundesliga 2 in 2014 and - despite various injury set-backs - is pushing 200 Bundesliga outings. The 29-time USA international won his first major honour as a professional in the 2018 DFB Cup. Like Brooks, Jones has American-German parentage. After graduating from Frankfurt's youth academy, he joined Bayer Leverkusen and later moved to Schalke. A bona fide midfield hard man, Jones is the most-carded American in Bundesliga history (56 yellows, five reds) - although nine goals and 13 assists point to a more refined side. "On the pitch, I must be a dirty pig. It's not fun to play against me." Those are the words of Bradley, who moved to Gladbach from Dutch outfit Heerenveen in the summer of 2008. The mud-loving midfielder, who is the son of former USA head coach Bob Bradley, made 28 Bundesliga appearances in his first season at Borussia-Park as the Foals narrowly avoided relegation to the second tier, and was a virtual ever-present in 2009/10. If Bradley's the hog of the bunch, Pulisic has to be the Swallow-tailed Hummingbird. Swapping his Pennsylvanian homeland for Dortmund at the age of 16, 'Captain America' has been flying high in the career fast lane ever since. He made his Bundesliga debut in January 2016 - the first of over 75 outings in the German top flight to date - and has broken all manner of records at club and senior international level. Watch: Pulisic's Top 3 Bundesliga goals so far! Pulisic is the second youngest non-German to score in the Bundesliga and the youngest ever to register two goals in one Bundesliga game; he also became the third-youngest player in history to reach 50 Bundesliga appearances in 2017/18, the youngest to be named US Men's Soccer Player of the Year and celebrated 100 Dortmund appearances with a Champions League goal away to Club Brugge on his 20th Birthday. 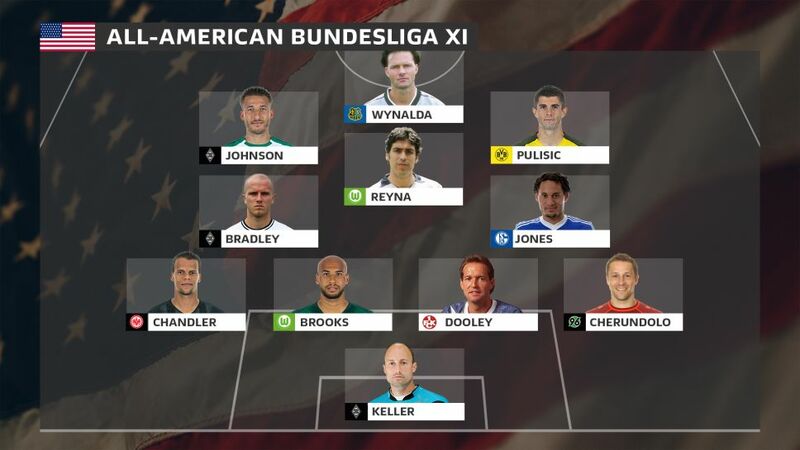 What is more, the Hershey-born ace is already the Bundesliga's highest-scoring American with 10 goals. A star at college level, Reyna joined Bayer Leverkusen as a 21-year-old after forcing his way into the host country’s squad for the 1994 World Cup. Having got limited game time in Leverkusen, he moved on to newly promoted Wolfsburg, where he enjoyed two brilliant years. Reyna was the Wolves' most expensive signing in 1997, but it proved money well spent. In his first season, the classy playmaker scored four goals in 28 Bundesliga games to help his team stay in the top flight. If you liked that little factoid, you'll love this one on Johnson. Sure the Munich-born wide man plays for the USA now, but there was a time when he was kicking about with the likes of Jerome Boateng, Mats Hummels and Manuel Neuer in the Germany U21s team that lifted the 2009 UEFA European Under-21 Championship. It took a call from Jürgen Klinsmann to switch his allegiance, an opportunity born of some eye-catching displays in the Bundesliga with Hoffenheim. The Bundesliga's Mr.Versatile, formerly of 1860 Munich and Wolfsburg, later joined Gladbach, whom he helped achieve a maiden Champions League qualification in his first season with the club (2014/15). The second American to score for a Bundesliga club - Hungary-born Mate was the first, in the 1960s with Hamburg - Wynalda hit nine goals, including a couple of doubles against Karlsruher and Gladbach, in his debut season at Germany's top table with promoted Saarbrücken.